Who's going to replace Steven Moffat as Doctor Who showrunner? Steven Moffat's been in charge of Doctor Who's storytelling since 2010, and he's probably nearing the end of his tenure. So everybody's wondering who could take over this insanely demanding job, when the show regenerates next time. Let's break down seven prospects, in order of most likely to least likely. Doctor Who is one of the most demanding shows on British television, filming for nine or ten months of the year and requiring substantial amounts of writing work and rewrites, without having a massive writing budget (one of the reasons recent showrunners have written a large number of scripts themselves). The BBC would also presumably prefer someone with showrunning experience who can cope with the show's arduous schedule and demands. Here's a run-down of some of the candidates believed to be in the running, together with maybe a couple of bonkers choices. Doctor Who experience: Wrote the episodes School Reunion, The Vampires of Venice, The God Complex and A Town Called Mercy, as well as the Torchwood episode Greeks Bearing Gifts. Other experience: Created and produced No Angels for Channel 4 which ran for three successful seasons before creating Being Human for BBC3. A major hit smash for the channel, it ran for five seasons and spawned a popular American remake, itself in its fourth season. My girlfriend informs me it must be mentioned that Whithouse is thus responsible for the rise to fame of Aidan 'Human Perfection' Turner (not my words), for which we must all be eternally grateful. Whithouse has written and produced The Game, a spy thriller for the BBC due to air later in 2014. Pros: Whithouse has significant writing and showrunning experience and his episodes are (mostly) well-regarded. Whithouse has also - provisionally and cautiously - said he'd be interested in the role if offered. Cons: Whithouse's new project, The Game, might be a big hit and he might prefer to concentrate on that. Beyond that, there's not too many problems. Doctor Who experience: Gatiss has written four Doctor Who novels, starting with Nightshade in 1992. He has also contributed multiple short stories to anthologies. His scripts for the new series are The Unquiet Dead, The Idiot's Lantern, Victory of the Daleks, Night Terrors, Cold War and The Crimson Horror. He has appeared twice in the programme as an actor, playing Professor Lazarus in The Lazarus Experiment and Gantok in The Wedding of River Song. He wrote and produced An Adventure in Space and Time, the extremely well-regarded drama about the creation of Doctor Who. Gatiss has also played the Doctor in various comedy sketches. Other experience: Gatiss was one of the co-creators and co-producers (as well as writer and actor) of the League of Gentlemen comedy franchise, incorporating three seasons of a successful TV series, a feature film and radio shows. He co-created the international smash hit show Sherlock with Steven Moffat and co-showruns it. Pros: An extraordinary amount of Doctor Who experience and passion for the programme.An Adventure in Space and Timeis widely-regarded as the highlight of the show's 50th anniversary celebrations. Cons: His script work on the show itself has drawn a mixed reception, though his recent episodes have been better-received. Gatiss was recently cast in the role of Tycho Nestoris on the HBO series Game of Thrones. Although a small role, it is one that is expected to recur regularly over the next 2-3 years. However, the show has shown an ability for recasting minor (and even larger) roles when needed. Doctor Who experience: None whatsoever. Other experience: Overman has written for shows including New Tricks and Merlin, but is best-known as the creator of the BAFTA-winning Misfits for Channel 4 and the Dirk Gently TV series for the BBC (based on the novels of Douglas Adams). He also created the police comedy Vexed and, most recently, is the co-creator of the BBC drama Atlantis. Pros: Misfits is one of the most well-received and critically-acclaimed UK SF shows of the past decade and is a cult success in the United States.Dirk Gently was also well-received. Overman's familiarity with the SFF genre and his experience combined with a lack of working on Doctor Who previously gives him a good, fresh perspective which the BBC might find attractive. Cons: Vexed and Atlantis have not exactly been setting the world on fire. The BBC has renewed Atlantis for a second season, which may take up too much of Overman's time. Doctor Who experience: Wrote the episodes The Ring of Akhaten and Hide for the previous season of Doctor Who and will be contributing two scripts to the next. Other experience: Neil Cross is the creator and executive producer of Luther, which, alongside Doctor Who and Sherlock, has been the BBC's most successful drama production of the last few years. He is also an experienced scriptwriter on movie projects, penning the recently successful horror film Mama. He is a frequent collaborator of Guillermo Del Toro, penning the script for his on-hold Lovecraft adaptation (At the Mountains of Madness) and the forthcoming Midnight Delivery. He also performed rewrites on Pacific Rim. Cross is also an experienced novelist and has been longlisted for the Booker Prize. Pros: Cross is a formidable writing talent, with a number of varied projects in different genres under his belt. His telephone contacts list is also interesting: could we imagine a Doctor Who episode directed by Del Toro and featuring Idris Elba? His relatively limited Who experience but clear genre savviness could give the show a jolt of fresh blood and a fresh perspective. Hide was a pretty good episode. Cons: Cross is based in New Zealand and prefers not to travel abroad for long periods (along with budget issues, presumably one of the reasons Luther's seasons were only three episodes long). 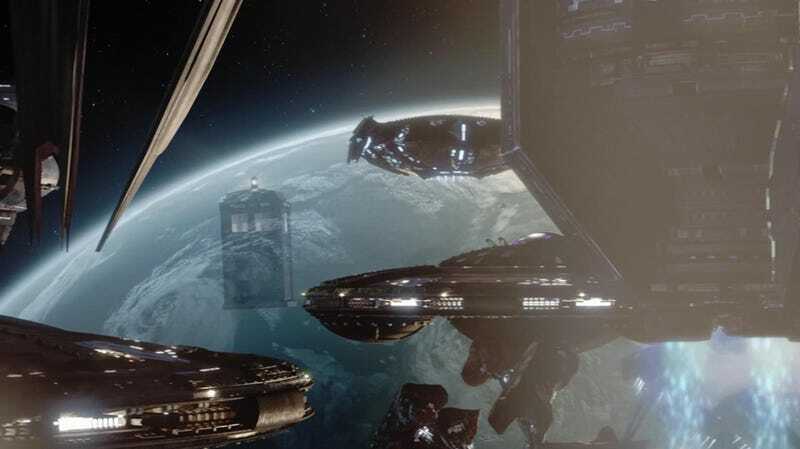 Becoming a Doctor Who showrunner would require a permanent relocation to the UK for several years. This would also require Cross to put his lucrative Hollywood scripting career on hold, or at least reduce it substantially for several years, which he may not be keen to do. Also, The Rings of Akhaten was embarrassingly bad, despite some good ideas. Doctor Who experience: Chibnall has written five episodes of Doctor Who (42, The Hungry Earth, Cold Blood, Dinosaurs on a Spaceship and The Power of Three) and eight episodes of Torchwood. His Torchwood script, Cyberwoman, is regarded as possibly the writing nadir of the entire combined Doctor Who-and-its-spinoffs franchise to date. Other experience: Chibnall has also written two episodes of Life on Mars, multiple episodes of Law and Order: UK (on which he has also served as a producer) was the prime creative driving force on the badly-received 2011 historical fantasy series Camelot(interestingly, Chibnall had pitched this show to the BBC years earlier which eventually saw the light as the far superior Merlin, without Chibnall's involvement). In 2013 Chibnall penned the extraordinarily well-received series Broadchurch (starring Doctor Who's David Tennant), which will be both getting a sequel series and also an American remake. Pros: Chibnall has a tremendous amount of writing experience on Doctor Who and Torchwood. Broadchurch has - somewhat unexpectedly - given Chibnall a renewed cachet and a stronger reputation on the UK drama scene. Cons: Chibnall is really unpopular with Doctor Who fans. His episodes are widely-regarded as being among the new show's weakest, and his Torchwood work was, at best, risible. Broadchurch Season 2 and its forthcoming US remake also make it unlikely he'd have the time to work full-time on Who. Doctor Who experience: Neil Gaiman is the writer of the extremely well-regarded episode The Doctor's Wife (which won a Hugo Award) and the somewhat less-well-regarded Nightmare in Silver. Other experience: Gaiman is the writer of the highly critically-acclaimed graphic novel series Sandman, regarded as one of the most important comic series ever written. He's also written well-regarded novels including American Gods,Anansi Boys,The Graveyard Book and the recent The Ocean at the End of the Lane. Several of his books have been adapted as successful films, including Coraline and Stardust. He was also the only person other than J. Michael Straczynski to write an episode of Babylon 5 in its last three seasons. He is also the creator of the TV mini-series Neverwhere, which he later adapted into a bestselling novel. He has been working on a TV version ofAmerican Gods for the best couple of years, formerly at HBO but now for an unidentified network. As well as being a major fan of Doctor Who, Gaiman is also a fan of the works of Douglas Adams and has penned a book about the Hitch-Hiker's Guide to the Galaxy novels and radio play. Pros: Gaiman is highly-regarded for The Doctor's Wife and his many other works. He has an almost unassailable level of 'geek-cred' amongst SFF fans. He is extremely well-known in both the UK and USA, and would likely broaden the show's appeal further in the USA. Cons: Gaiman prefers to work on several projects simultaneously rather than one for very long periods of time. He is also based in the United States and would likely prefer not to have to return to the UK to work on the series. Most notably, although a very fine writer he does not have much day-to-day showrunning experience. The American Gods TV project also seems to be a time-consuming project moving forwards, and it is possible that a new attempt to make a Sandman movie (by Joseph Gordon-Levitt) may also require his attention. Doctor Who experience: J. Michael Straczynski was a fan of the original Doctor Who in the 1970s and 1980s. He has cited it - along with The Prisoner and Blake's 7- as an influence on the writing of his TV show Babylon 5. Specifically, he has cited the season-long story arcs (such as the Key to Time season) as being influential on his development of Babylon 5's story structure. Other experience: Straczynski was a script-editor and producer on shows likeMurder, She Wrote and Captain Power whilst also writing for animated series including He-Man and Ghostbusters. He is best-known for being the co-showrunner and primary writer of Babylon 5, which ran for five seasons in the late 1990s and is credited with the boom in 'story arc' storytelling in television (which Doctor Who itself has latterly employed). Straczynski later went on to become the primary showrunner on Jeremiah before writing the script for the Clint Eastwood move Changeling. He is also extremely active in comics, writing for everything from Spider-Man to the recent Before Watchmen project. Pros: JMS is a highly experienced writer and showrunner. He is famed for bringing in shows under-budget and on time (a notably different situation to the Moffat era of Doctor Who). He is, generally speaking, well-regarded as a writer, though his extremely prolific output (he wrote some episodes of Babylon 5 in less than a day) does mean there's a fair amount of mixed material as well. Cons: JMS is American, based in LA and is working on the TV series Sense8 for Netflix, based on an idea from the Wachowskis. This would presumably tie him up for some years to come, and it's unlikely he'd be willing to relocate to London, despite occasionally-voiced ambitions to retire to the UK to write novels. JMS is also well-known for having many fingers in many pies and it's unclear if he would be willing to give up his comics work and other projects to commit to Who for such a long time. Likelihood: Non-existent. If they ever do a US-based remake or reboot of the series, however, don't be surprised if his name came up. This article by Adam Whitehead originally ran at his blog, The Wertzone. Follow him on Twitter.